Samsung HT-C9950W review | What Hi-Fi? As a high-end home cinema system, the Samsung HT-C9950W is a brushed-aluminium feast for the senses. Subwoofer apart, every major component is designed for either wall-mounting or use atop elegant, cable-concealing pedestal stands, with the central disc-playing hub as the system's focal point. With its motorised volume control, touch-sensitive buttons and slot-loading disc mechanism, it's as superficially desirable as anything Bang and Olufsen could conjure, although predictably, build quality isn't quite to that exalted standard. Given how complete Samsung's cheaper home cinema systems are, it's no surprise that the HT-C9950W's specification is remarkable. It can be configured either in classic 7.1 ‘surround-back' or new-fangled ‘front-height' Pro-Logic IIz style, and you also get wireless transmission to the two larger rear speakers. USB and Ethernet inputs support replay of a comprehensive array of digital media formats, and a wi-fi dongle takes care of installations where wired network access isn't available. All this, and the Samsung system also handles 3D Blu-ray, HD Audio, streamed media from services such as LoveFilm and audio from your iPod. So, it looks pretty amazing and it's comprehensively equipped – but how does it perform? At first listen, it's a powerful performer. Its hefty active subwoofer marks a clearly audible improvement over the passive designs typically found in most comparable systems. 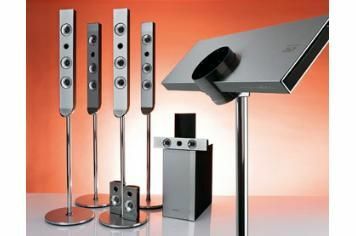 And set up with its front-height speakers in situ (PLIIz-style), there's plenty of dynamic range and scale – but even after extensive tweaking, there's also a less-than-refined edge to treble that's hard to reconcile with the price tag. Images are crisply drawn and colours are dense, but we've seen players with a better grasp of rapid motion, both in 2D and, especially, 3D. The HT-C9950W is a competent DVD upscaler, though, and its online video (while variable in quality, as you'd expect) is perfectly acceptable. So, where does that leave us in terms of star rating? Obviously, price is a major factor here – but not in the way you might expect. It's true that £1800 can buy you a heck of a home cinema separates system – but it's equally true that if you're interested in something that looks like the Samsung, separates kit is unlikely to appeal to you. No, what's far more relevant is that Samsung's stylish, very well specified and very-nearly-as-capable HT-C6930W system will cost you at least £1000 less. The HT-C9950W is better than its sibling, both aesthetically and technically, but it is certainly not that much better.